Living near the seaside we tend to make a lot of sea crafts for kids, I love the way the seaside inspires kids to be creative! 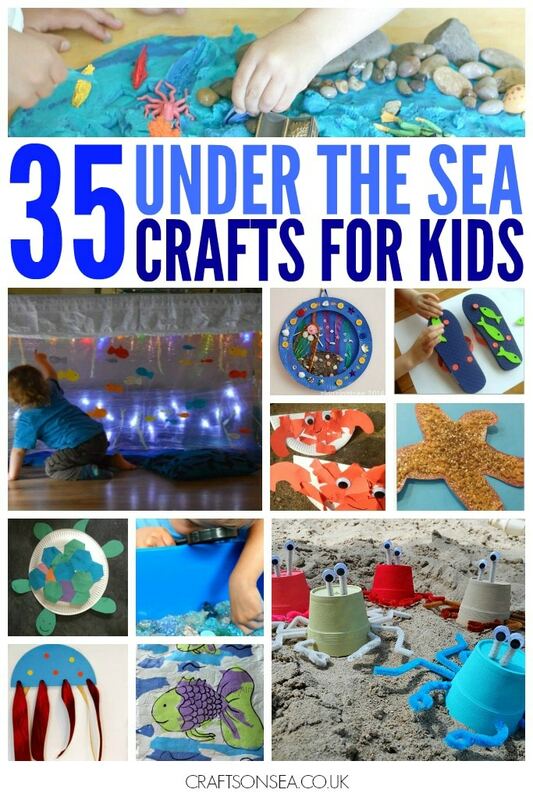 As a blogger I also get asked a lot about what ideas I like so I thought it would be fun to share some of my favourite under the sea crafts for kids! There’s so many great ideas in here I’m sure you’ll find something that will inspire you and your kids too. This DIY ocean small world is perfect for small hands. I absolutely adore this under the table ocean from Family Days Tried and Tested. What better way to make your kids feel like they’re under the sea?! There’s no one I’d rather bump into under the sea than this cute mermaid. This gorgeous collage from Zing Zing Tree is one of my favourite crafts! Why not try printing your fish with this fun flip flop activity from J Daniel 4’s Mom. We had lots of fun making these rocking paper plate crabs, they’re great for fine motor skills too! This sparkly starfish is a great sensory craft for kids. This paper plate sea turtle was made by my one year old! Let your kids feel like they’re really exploring under the sea with this great sensory bin from My Nearest and Dearest. This jellyfish craft is super effective but simple enough for all ages to enjoy. True Aim Education has a fantastic tutorial for these lovely tissue paper fish. I love these styrofoam cup crabs from Crafts by Amanda. I love the way Mum in the Madhouse has used bubble wrap for her under the sea picture. If your kids like hands on activities then they’ll adore this recipe for ocean slime! Buddy and Buggy show you how to make your own under the sea painting using chalk paint. I love these sweet under the sea pictures from In The Playroom. This cool octopus craft is made from a toilet roll, or you could try this one made from a water bottle! This whale collage is a perfect craft to be done as a group activity. I love the way this cute rainbow fish craft steps up a gear by involving a coat hanger! With a bit of help I think this starfish wreath would be suitable for all ages to make. Create an under the sea diorama for a perfect three dimensional under the sea craft for kids! This under the sea themed play dough looks like fantastic fun! Teach your kids about colour matching with this fantastic jellyfish activity from School Time Snippets. How sweet is this hand print dolphin?! Make this under the sea world in a bottle to discover the different zones of the ocean. Oh my goodness, you must check out the picture in this post where K C Edventures drew a lifesize whale! We made a paper plate orca. Make learning fun and find out about the life cycle of a sea turtle with this sensory bag. Mother Natured turned her whole playroom into an under the sea craft for kids. Woah! I love this sweet ocean animals paper plate craft. Red Ted Art did some fun upcycling to make these fun fish to play in the bath with. This foil fish mobile from Powerful Mothering would make a great group activity too. Use the ocean to inspire your kids to learn with this under the sea alphabet activity. MultiCrafting Mummy has a fun bubble wrap jelly jellyfish craft. I love the way cupcake liners have been used in this shark craft from Crafty Moms Share. 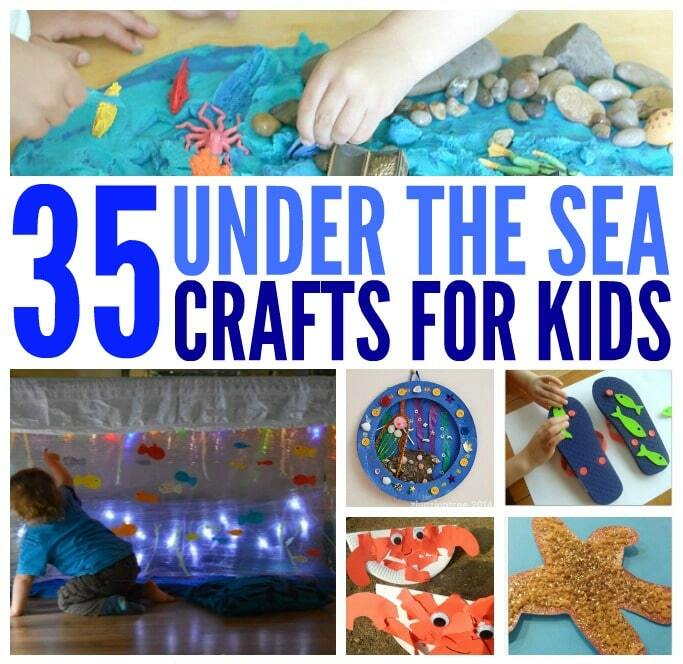 If you love under the sea crafts for kids be sure to follow my Pinterest board for more inspiration!